I attended Symantec Vision 2010 at the MGM Grand in Las Vegas this week. On Monday I wrote that I didn't really understand Symantec's desktop virtualization positioning and that I felt they'd lost momentum coming into 2010. At the end of my fourth(!) 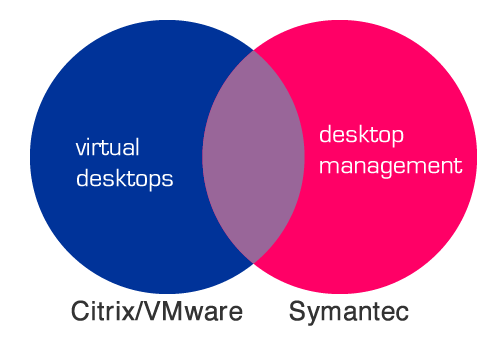 day here, I feel like I understand how Symantec fits into the virtual desktop world of 2010+ and how they're positioned against Citrix, VMware, and traditional desktop management solutions. I've spent the past ten-plus years with a fairly narrow focus, concentrating on the technologies that are now collectively known as desktop virtualization. So this is why Symantec wasn't really relevant to me until just recently. (It wasn't until 2008 that I considered them a major desktop virtualization vendor.) And once that happened, it's almost like I forgot that there are a lot of "traditional" desktop management issues that still apply with virtual desktops. So prior to this week, I viewed Citrix XenDesktop and VMware View as "complete" desktop virtualization solutions (notwithstanding the fact that View is essentially VDI-only). My point is that I thought Citrix and VMware were real, and if you looked at the feature list of those two compared to Symantec, VMware or Citrix would win every time. (Even though I still think Symantec's app virtualization is the best in the market, I didn't think it was enough to push customers to skip Citrix or VMware for Symantec's whole suite.) So my feeling was that with Citrix and VMware, customers got a full solution, but with Symantec there were too many holes. So why would anyone use Symantec? But this week I realized that Symantec's other products fill a huge desktop need that neither Citrix nor VMware fills. And I don't mean the traditional desktops that are often side-by-side along virtual desktops. I'm talking about traditional desktop management needs that also apply in virtual desktop environments—needs that neither Citrix nor VMware fulfills. For example, Symantec has products that do desktop control and lockdown, security auditing, policy control, management, data protection and backup, AV, etc. So if you're a Citrix or VMware desktop virtualization customer, you still need to "complete" your desktop virtualization solution with this stuff (whether that's from Symantec or not). The idea that you need all of this to deliver a complete end-to-end virtual desktop stack. And in this grand scheme, Symantec doesn't have fewer pieces than Citrix or VMware, they just have different pieces. So you have to decide for yourself which pieces you want to buy from which vendors. And today's reality is that from a pricing standpoint, any one of these three vendors can get aggressive bundling "non suite" products together. So what do you think? Do I make a good point, or did I drink too much Symantec Kool-Aid this week? The analogy with the Venn diagrams is fine, but the intersection is blank and does not show anything unique from Symantec. They are a security DNA company, and have executed poorly on desktop management. Altiris was a good buy and they did nothing with it. It is now left in ruins with only people whoâs careers depend on it defending it. You are right, Appstream kicks the $hit out of App-V in many ways (streaming native MSI is one good example) as is their backend infrastructure that does not require Systems Center. Itâs unclear to me (happy to be educated) what unique value Symantec brings to the table and why anybody should trust them to execute....in addition to total lack of clarity of their future roadmap. Granted they may offer an alternative to VDI which will remain a niche play as it stands today. Therefore I like options of choosing models, even if today many of them are disjointed, which I would brush Citrix and Quest with. I don't really have much to add one way or the other with respect to Symantec, but I think I think it would paint an interesting picture if you added Microsoft to your Venn diagram. Ok, so I readup and Symantec have some 17k employees and was founded as early as 1982. With that information I'm honestly a bit upset and kinda wondering of the year after year repeated mantra "Avoid Symantec" that with equal force was repeated again and again through all my professinal life, "Symantec - the destoryer of worlds" - Every bit since I knew 1,0 I've been in constant wonder and agony. Who the hell is Symantec and aside of consuming up my old IT(that was 1998), what are they set to accomplish. What the hell is this? Who are they? What's up? I sort of feel that the diagrams should be made of swiss cheese. Even with everything offered, there are still holes in the technologies needing to be filled. But that's what makes this space so much fun! Brian I think you may need to explain the technologies that Symantec can bring to the table that others can't. I was at Vision this year, and have been using the Altiris management suites for seven years now. What Symantec brings is really a complete solution in regards to security and client management. Do you need to know if someone is trying to copy off records of credit card numbers off your network, Symantec can stop this from happening and report back to you where any senstive data exists, and who has aceess to it. They can also monitor your network for network attacks and stop/report incidents all from one interface. I also think they have they best automation Workflow component which can easily tie together all of IT administrative tools into one interface which is easy plug into each other. It may take some work but I could easily see some use something like this to mimic the Lab Manager product for Hyper-V or vSphere. He'll I even want to even use their server management suite component to do much of admistrative tasks that simply aren't possible with vCenter today. Do want make mass changes to multiple hosts across multiple datacenters across the world? Symantec can can do it. Want to share images/templates across all your dsracenters across the world, Symantec can do it. Not to mention the monitoring solution which can give you the health status of all servers in one interface regardless if their local, remote, Hyper-V, ESX, physical etc. I think it's funny how VMware is suddenly market their cloud initiative, when it's clear to that Symantec is better prepared then VMware at standing up a complete private cloud solution. Hi Brian, and thank you for your brilliant work on these subjects. Symantec buys everything, (at least it was true until last year) and so they bought Altiris for one billion. As the Symantec CTO said in a conference I attended: they bought Altiris in 2007 for two products: the Altiris Notification Server (which has been renamed "Symantec Management Platform") and SVS (Software Virtualization Solution, now a minor item in the "Workspace" range of products). The fact is that, even with their 17.000 employees, unlimited financial resources, and experts all around the world, they strictly did nothing else with Altiris products than port them in a new "yellow" Symantec design and lower their global quality, due to changes in the product managers teams. SMP agents does not work with Remote Desktop nor XenApp sessions. The integration of other Symantec products, like SEP or BESR, in the Managment console reflects a deep misunderstanding. The Workflow solution, presented as a global automation tool, is a developper tool out of reach for the common administrators. In a word, Symantec organism is not accustomed to a food as rich as Altiris. The only Symantec employees that defend Altiris products are former Altiris employees who would like to see their story continue. Others would like these complicated and hard to sell products desappear from their offer. If Symantec cannot integrate a traditional client management framework (think SMS/SCCM, Landesk...), how could they make a step in the Thin client and Virtualization domains, which exist since 15 years, and where they are completely new? The only device they know is the desktop. Microsoft has much more to say on the subject, because they have been in virtualization for years and have tuned their management platform (SCCM) to deal with it. And even for Microsoft, it is hard to stay in the run. My opinion is that Symantec is doing marketing and communication about VDI, but when you dig, you only find traditional desktop stories, the only ones they can make money with (SEP and BESR).